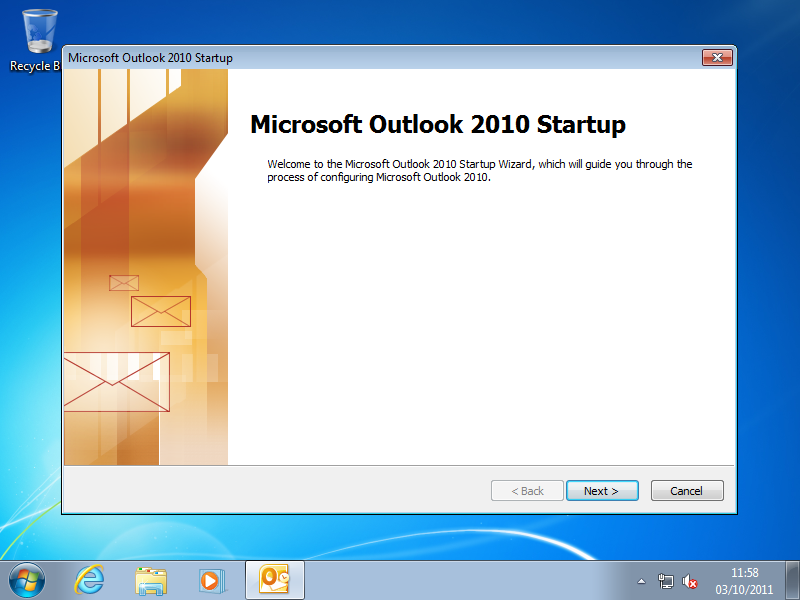 What used to be a fiddly job, is now very simple to do, setting up Outlook Anywhere (formally known at RPC over HTTP) takes about 10 minutes. This is a system that lets you connect Microsoft Outlook to to your Exchange server over the web, this means you can connect to to your email, calendaring and tasks etc, without the need for a VPN connection. 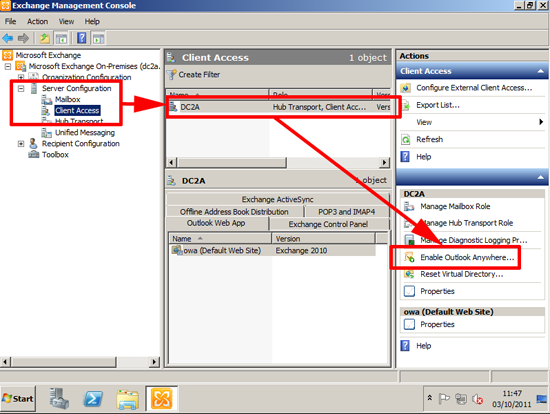 If you plan to deploy Outlook Anywhere with Exchange 2007 there is an additional step you need to carry out before you start. From server manager > Feature > Add Features > Add in the ‘RPC over HTTP Proxy’ feature before you start. 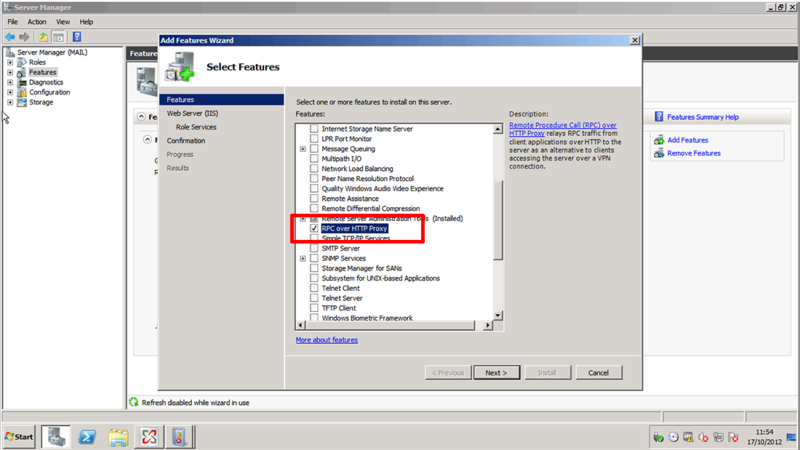 (Note: you DONT need to do this if you are running SBS 2008). 1. 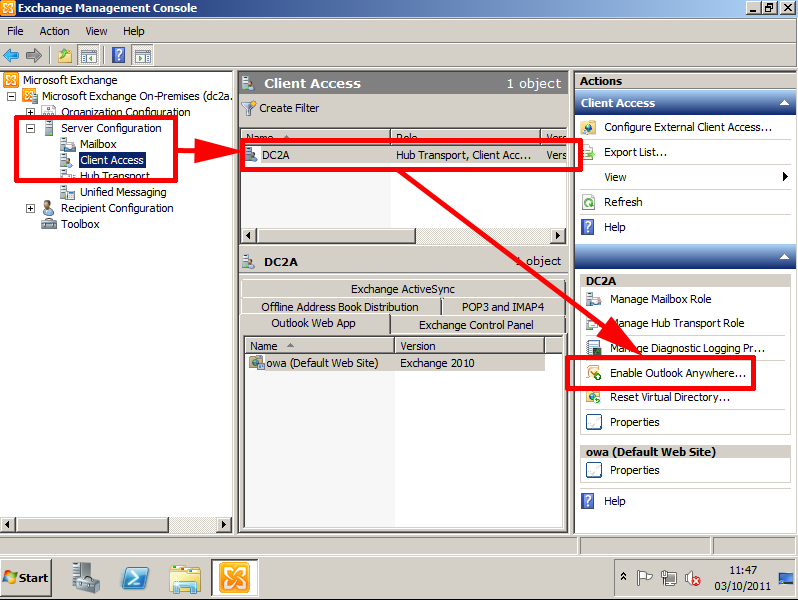 First we need to turn it on: from within the Exchange Management, expand Server configuration > Client Access > Select the server in the central pane > Select “Enable Outlook anywhere” in the action pane. 2. 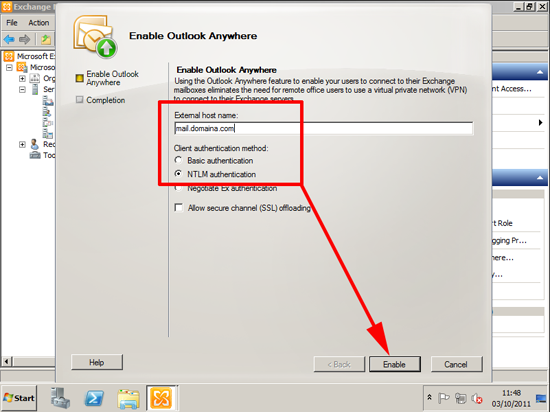 Enter the publicly addressable name of your Exchange server, for this example I’m using NTLM authentication > Enable. Note: The external host name is the address that you would type into a browser to contact the Exchange server i.e. 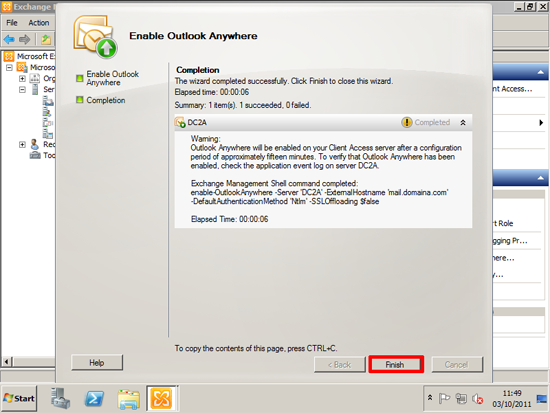 for Outlook Web Access http://mail.domaina.com/owa. 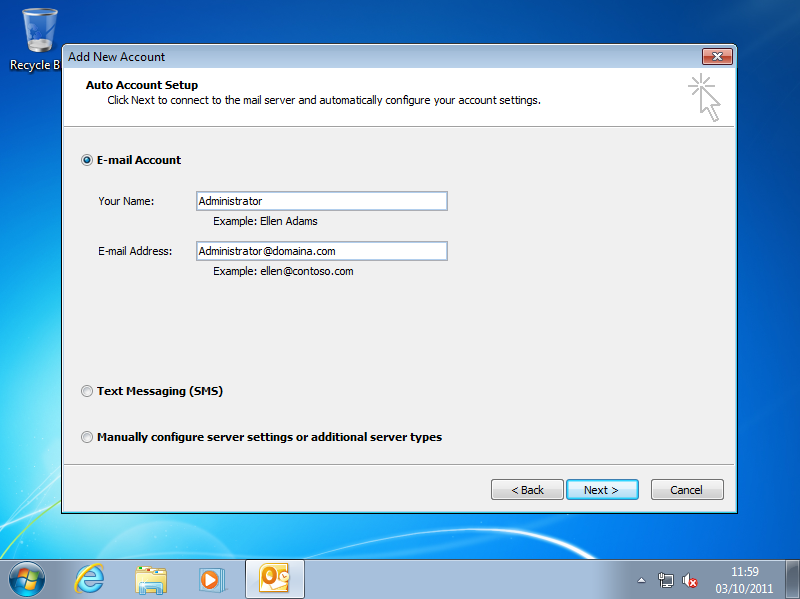 This would mean the public name is mail.domaina.com. This name must be the Common Name (CN) on the Exchange server’s digital certificate. 3. Take heed of the information, nothing’s going to work for 15 minutes (Even Exchange is telling you to apply the cup of coffee rule) > Go and have a hot milky beverage. 5. Event ID 3006 > Outlook Anywhere is up and running on the server. 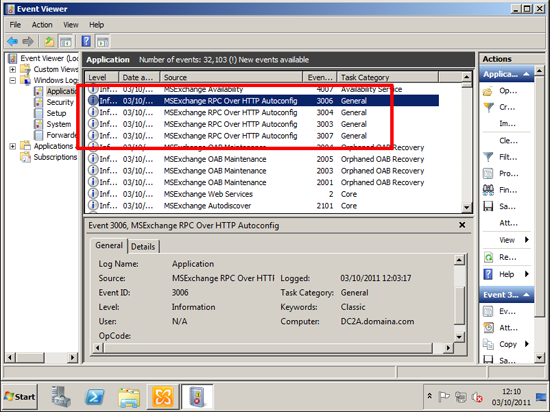 (Note: you will NOT see this on an Exchange 2007 Server, see the second screenshot). 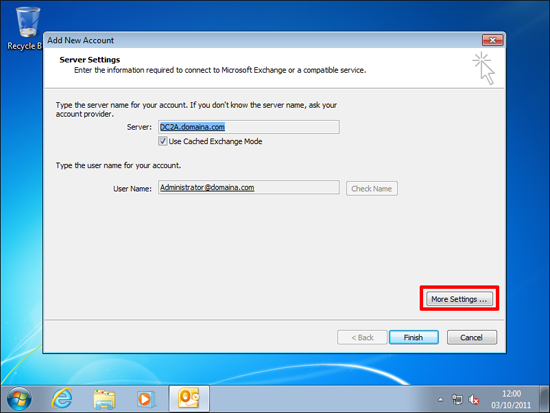 Note: To Access from Outside your network the public name of the Exchange server (in this case mail.domain.com), needs TCP port 443 (HTTPS) open to it, or “Port Forwarded” to the Exchange server. Note2: To work internally make sure that mail.domaina.com resolves to the INTERNAL IP address of the Exchange server. 6. You may also want to execute the following command. 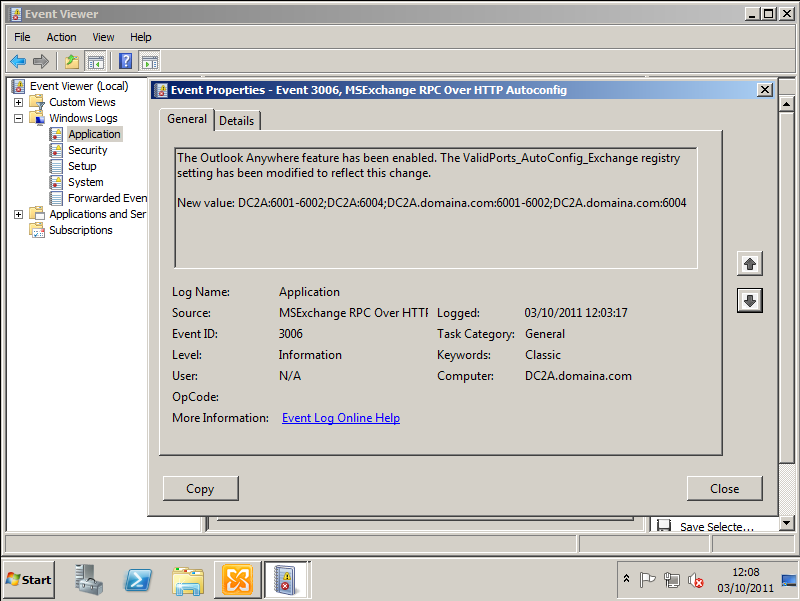 Particularly if you use SBS, which has a habit of setting remote.publicdomain.com as the default outside name. 1. 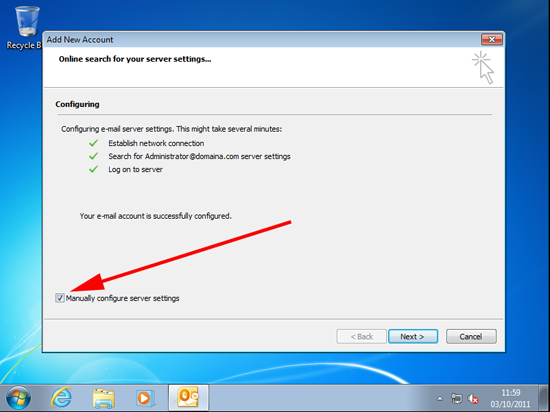 In this example I’m using Outlook 2010 and the mail profile/account has NOT been setup, if you already have an account edit it, select “More Settings” and jump to number 4. 2. If you are setting up your Outlook client internally, the autodiscover service should fill in the details for you. 3. If it auto configures the settings for you, tick the box to manually configure server settings. 5. 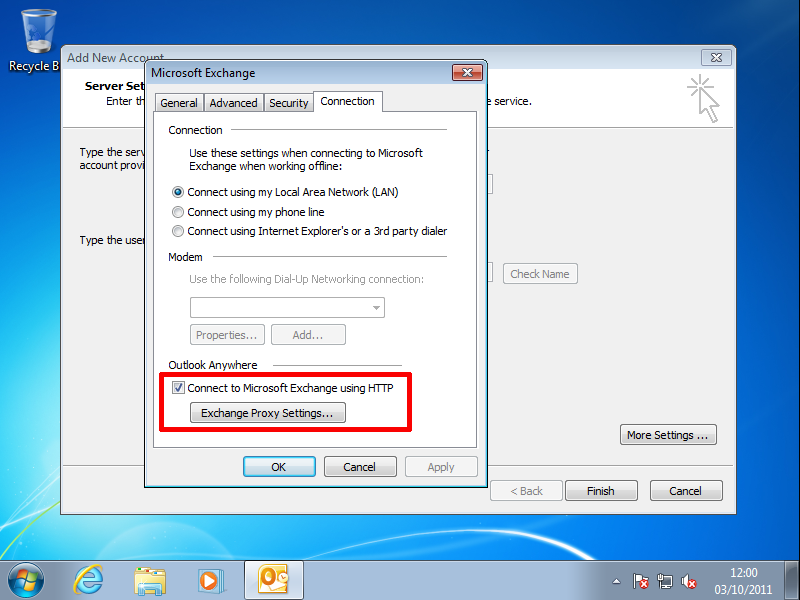 Connection Tab > Tick “Connect to Microsoft Exchange Server using HTTP” > Click “Exchange Proxy Settings”. 6. 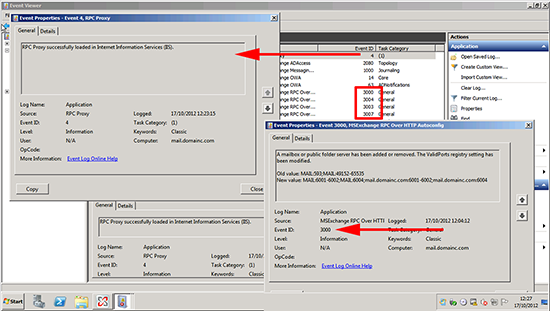 Put on the URL (Public name of Exchange – see step 1 number 2) > I’m using NTLM authentication you may be using basic, if you don’t know, check with your IT department, or try each one. 7. 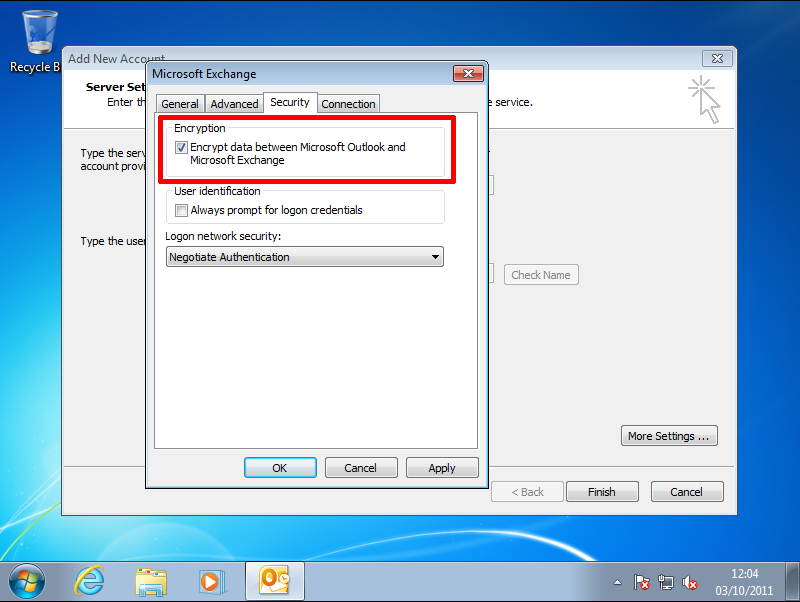 Security Tab > Ensure “Encrypt data between Microsoft Outlook and Microsoft Exchange” is selected. 8. Restart Outlook – you may be asked for your username and password again this is normal. Buy Your Exchange Certificates Here!